By going through what I refer to as the "backlog" of stuff that has been ignored, compartmentalized and avoided at all costs (Can't have anyone over? Lock up certain areas of your home for fear that someone will see your mess? Blood run cold when the doorbell rings? Then you know what I'm talking about here.) we are bound to run into some internal resistance. Getting rid of stuff is not as easy as it looks. With all of the Marie Kondo Life-Changing Magic of Tidying Up fervor, it can leave some people feeling like they just aren't doing it right if they can't tidy up their homes in a weekend or if they don't feel joy tossing stuff left and right. For most people, decluttering can be exhausting work. 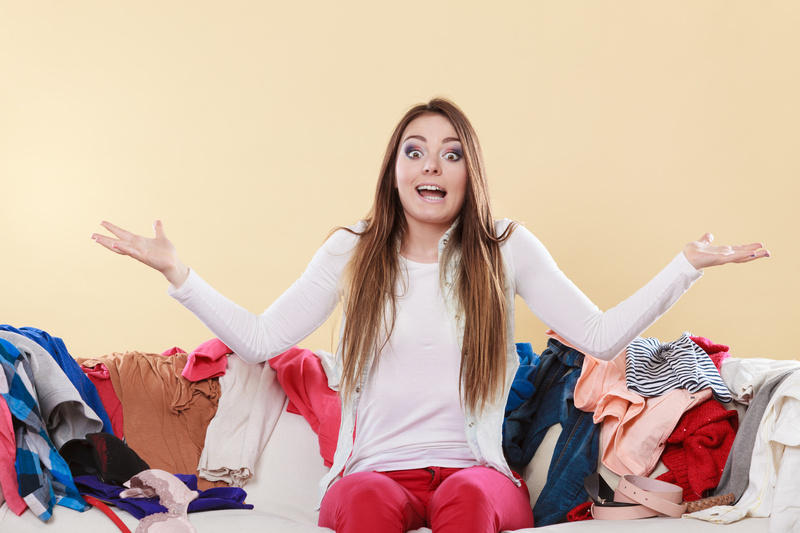 Recently a client said to me at the end of a four hour decluttering session, "Why is this SO exhausting? I mean I know this is hard physical work but it feels like more than that. How come?" Her comment echoed what I've heard hundreds of times from others on their decluttering journeys and is something that I've experienced myself. Here's the thing: it's really not about the stuff. Yes, it's very tiring to move stuff around, lift heavy boxes, and do the equivalent of 50 squats picking stuff up off the floor, but that's just part of what's going on. The truth is that decisions are finally being made, and some (ok, a lot) of those decisions are hard to make. When we are decluttering, we are opening up our minds and hearts to all kinds of emotions and memories. -I can't believe I haven't dealt with this until now. What's wrong with me that I let it get this bad? -OMG I have so much to do! I feel like my brain is going to meltdown. This is too overwhelming. There is something important in the other room...I need to go deal with that right now. -I've always hated this sweater that my parents gave me. They never really get my style and it hurts my feelings but I can't get rid of it because they'll notice. -My family doesn't care enough to clean up after themselves. Why should I do everything? -I had so much fun in college and I love hanging on to all the papers I wrote because it reminds me of awesome times. I wish my life was still that carefree. I could go on but you get the point. See how going through a pile of stuff can bring up a wide range of thoughts, emotions and memories? It takes a lot of energy to go on that rollercoaster ride. Sometimes it really is about the stuff. Like deciding which set of dishes you like better. And it's refreshing to let stuff go so that you can lead a more beautiful daily life. But I gotta tell you, I've worked with hundreds of people and lightweight decision making takes up a small percentage of our time together. The rest is sorting through memories and deconstructing stories. It does get easier with practice so keep going. The results are SO worthwhile. 1. Take a step back and listen to what's going on in your head. Is it your voice or the voice of your parents, your spouse or someone else who has had a lot of influence in your life. Get curious instead of upset. Imagine you are eavesdropping on someone else. What do you hear? Come at it with a curious mind and an open heart. 2. Step outside for a 5 minute break. When we are in overwhelm we need to do something to get us grounded again. Go outside and look at the trees and the sky. They are just hanging out doing their thing. They have no other agenda other than to just be. Breathe in that openness and stability. Life doesn't have to be crazy complicated. 3. Do the easy stuff first. Take out the garbage and recycling, break down empty boxes, dump the dirty laundry that needs to go in a hamper, toss those moldy flowers and long dead plants, gather all the coffee cups and stash them in the dishwasher. Once we get that no-brainer stuff out of the way the space will feel better immediately and it will give us a surge to move on to the next group of stuff. I know that's a tall order but you gotta remember that this stuff didn't appear out of thin air and has probably been there for a while. How do you eat an elephant? One bite at a time. How do you declutter your house? Twenty minutes at a time. Be patient, be kind and use your timer! Need some accountability? Then do yourself a big favor and ask a positive, upbeat friend to help you or join a community of people doing the same thing. It is so refreshing to be around other people who "get" how hard this can be and don't just tell you to "clean it up already." Trust me when I tell you, you are not alone, you are not crazy, and loads of other people are dealing with the same stuff you are. I'd love to know, what's a common thing that pops into your head when you're decluttering your stuff? Did I hit on one of them here? Let me know in the comments below. Lisa Sharp is an International Professional Organizer and Space Healer who helps busy, overwhelmed women release the clutter that keeps them feeling stuck in life. Her mission is to create a world wide community of women who feel empowered, happy and ready to show up as their truest selves, unencumbered and free of the tyranny of too much stuff. She is based in Atlanta and lives in a tiny, organized, happy home. You can find out more about Lisa and her work by visiting her website, and you can find her on Facebook, Twitter, Pinterest and Instagram. You can grab her free 7 Day 100 Item Decluttering Challenge here.